The VE sedan represented the fourth generation of Australia’s best-selling car range. It was the product of Australia’s first $1 billion car program and the most clean sheet development project in almost 60 years of Holden vehicle production. The VE was engineered from global architecture with potential for GM markets around the world and safety was a major factor. Electronic Stability Program (ESP®) was standard, all models could be purchased with six airbags; curtain airbags were available for the first time. A stiffer, stronger body structure with expanded use of high-strength steels, multiple load paths and optimised deformation zones met real world crash performance objectives. The VE made a dramatic style statement, characterised by a purposeful stance and pronounced wheel arches. Designers maximised interior space without making the car significantly larger. Individual models were more differentiated, inside and out. Refinements to Alloytec V6 and Gen IV V8 powertrains lifted power and torque, improved takeoff feel, responsiveness and torque delivery. 270kW peak power output from the 6.0 litre V8 was the highest ever offered on a standard Holden. Linear Control Suspension system delivered outstanding ride and handling without sacrificing ride comfort. An new electrical interface and expanded microprocessor capacity provided improved safety and infotainment capability. Heating, ventilation and air conditioning systems were totally new. An Omega nameplate replaced Executive and Acclaim and a new V Series concept – SS V and Calais V – highlighted top-range choices. VE sedans are exported under the GM brands of Chevrolet, Holden, Pontiac and Vauxhall to markets in the Middle East, Brazil, New Zealand, the United States and the United Kingdom. The VE Ute went on sale in October 2006. It offered more features, more useable interior space, greater storage flexibility and more performance than any of its predecessors. 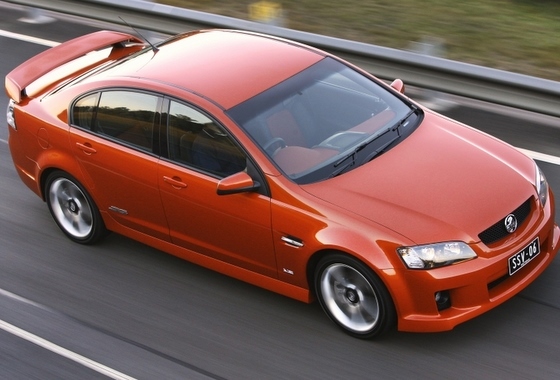 A VE Commodore Sportwagon is expected to be released in the first half of 2008. It takes the sedan’s sporty design and engineering advances and integrates them into a stylish and practical wagon with strong family appeal. Base price on introduction: $36,490. Still in production. Nice tight car to drive, unfortunately, the brakes are not the best. I think that I’m not the only one to make such a comment. There’s that, and another major concern, the under sized timing chain, which in my opinion should have been replaced free of charge when they stretched to a point that made the timing so far out there was no adjustment possible to compensate. Consequently the poor old consumer had to dig deep to find the hefty $3000 bill to install a heavier gauged chain to stop the problem from happening again. Unfortunately this problem happened just outside of warranty at around 100,000 km.